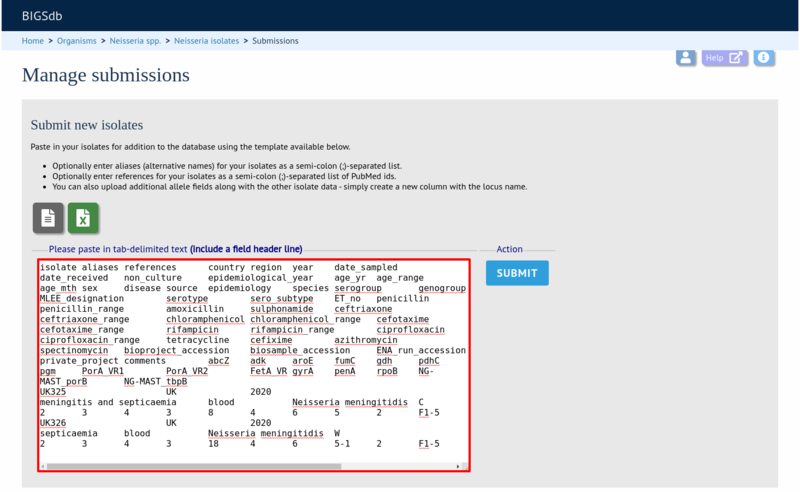 The automated submission system allows users to submit data (new alleles, profiles, or isolates) to the database curators for assignment and upload to the database. The submission system is enabled on a per-database basis so will not always be available. 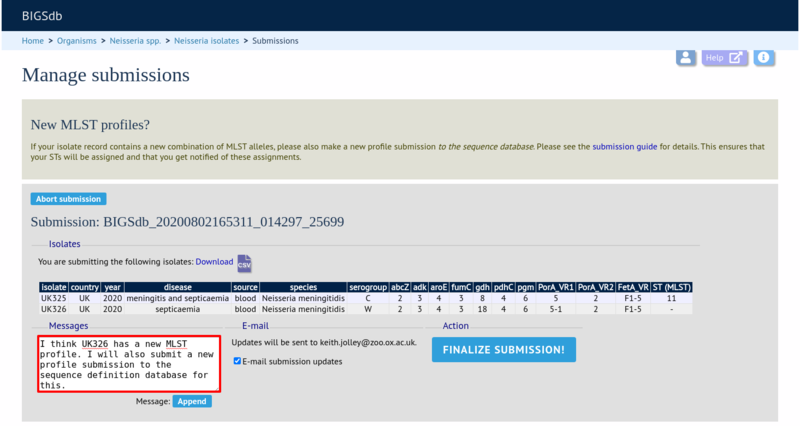 If the system is enabled, new submissions can be made by clicking the ‘Manage submissions’ link on the database front page. You must have an account for the appropriate database in order to use the submission system. On systems utilizing site-wide databases, such as PubMLST, this can be done automatically via the web. Other sites may require you to contact a curator to set this up. 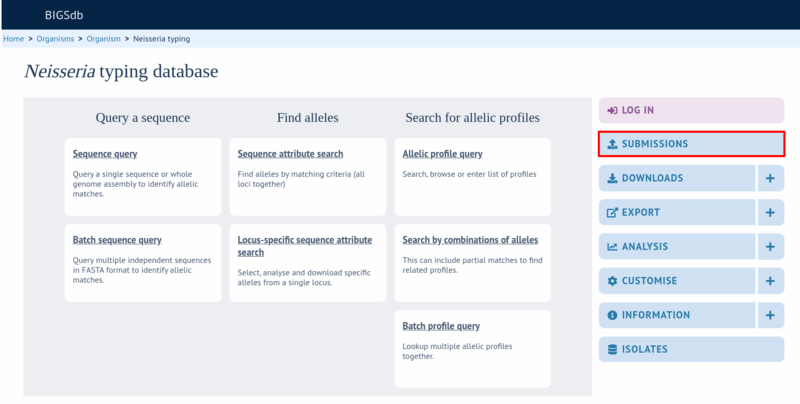 New allele data can only be submitted from within the appropriate sequence definition database. Submissions consist of one or more new allele sequences for a single locus. You will need to create separate submissions for each locus - this is because different loci may be handled by different curators. 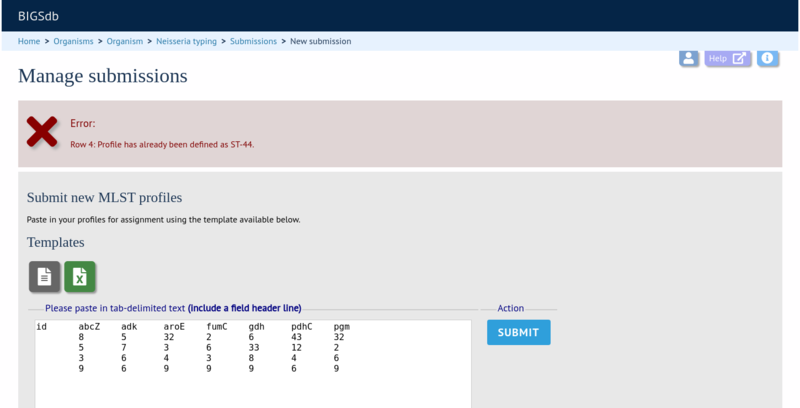 Click the ‘alleles’ link under submission type on the submission management page. The locus list may be very long in some databases. It may be possible to filter these to those belonging to specific schemes. If the scheme tree is shown, select the appropriate scheme, e.g. ‘MLST’ and click ‘Filter’. The locus list is now constrained making selection easier. 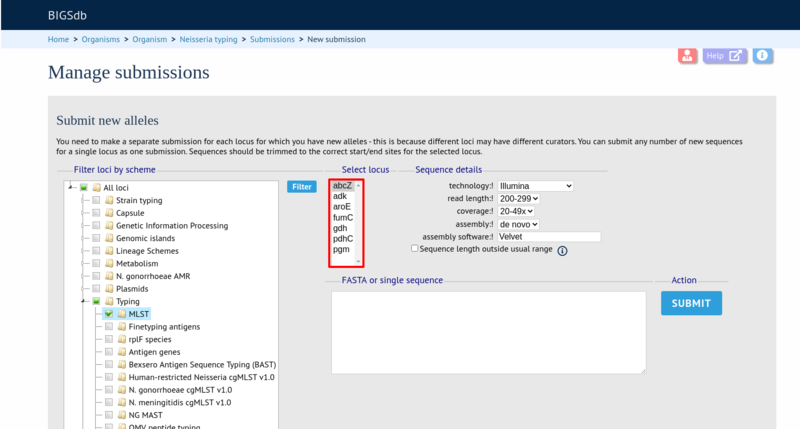 assembly software - this is a free text field where you should enter the name of the software used to generate the submitted sequence. Paste in the new variant sequences to the box. This can either be a stand- alone sequence or multiple sequences in FASTA format. The sequences must be trimmed to the start and end points of the loci - check existing allele definitions if in doubt. The submission is likely to be rejected if sequences are not trimmed. Click submit. The system will perform some basic checks on the submitted sequences. 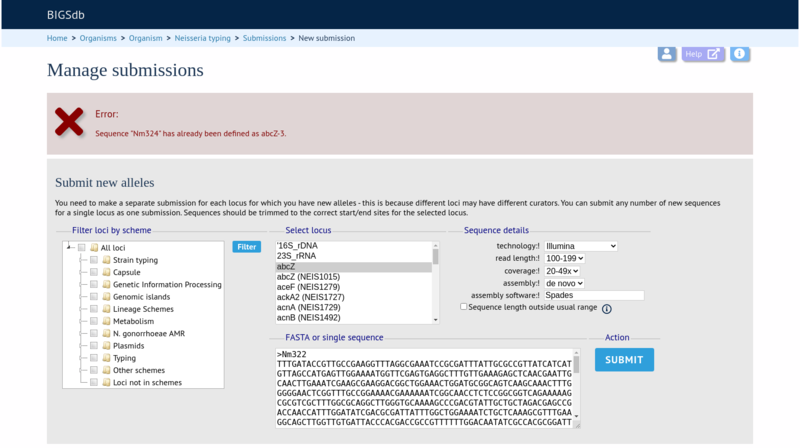 If any of the sequences have been defined previously they must be removed from the submission before you can proceed. Curators do not want to waste their time dealing with previously defined sequences. Assuming the preliminary checks have passed you will then be able to add additional information to your submission. If you wish to enter a message to the curator, enter this in the messages box and click ‘Append’. The message will be attached. A curator may respond to the message and attach their own, with the full conversation becoming part of the submission record. Some submissions will require the attachment of supporting files. This will depend on the policies of the individual databases. 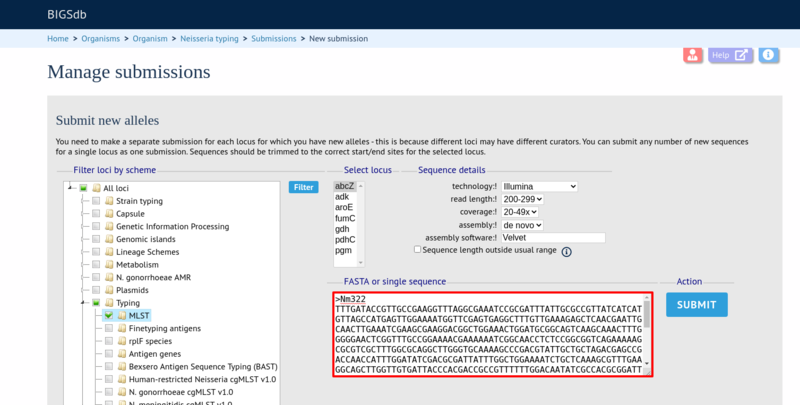 Sequences determined by Sanger sequencing should normally have forward and reverse trace files attached. Files can be added to the submission by clicking the ‘Browse’ button in the ‘Supporting files’ section. Select the file in the selection box, then click ‘Upload files’. The file will be uploaded and shown in a table. Files can be removed from the submission by checking the appropriate ‘Delete’ box and clicking ‘Delete selected files’. 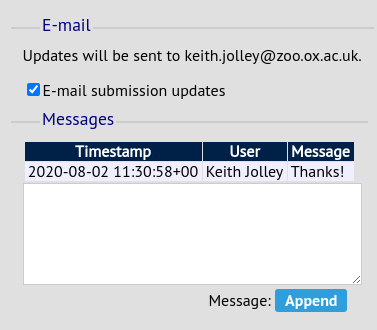 Make sure the ‘E-mail submission updates’ box is checked if you wish to receive E-mail notification of the result of your submission. This setting is remembered between submissions. Your submission will then be listed under ‘Pending submissions’ on your submission page. Most MLST databases on PubMLST.org require you to submit an isolate record for each new ST that you wish to be defined. In these cases, you should add the isolate name to the id field of your profile submission and make a corresponding isolate submission containing the allelic profile. 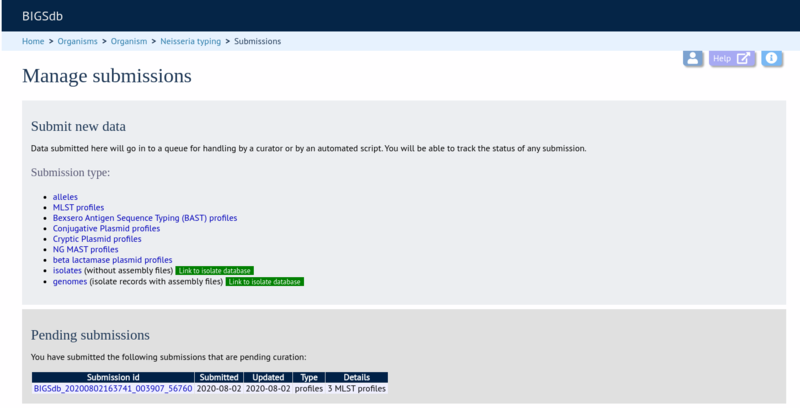 Click the appropriate profiles link under submission type on the submission management page. Download the Excel submission template. Fill in the template. The first column ‘id’ can be used to enter an identifier that is meaningful to you - it is used to report back the results but is not uploaded to the database. It can be left blank, or the entire column can be removed - in which case individual profiles will be identified by row number. Copy and paste the entire contents of the submission worksheet. Click submit. Some basic checks will be performed. These include whether the profile has already been assigned and whether each allele identifier exists. The submission cannot proceed if the checks fail. Some submissions may require the attachment of supporting files. These files can be added to the submission by clicking the ‘Browse’ button in the ‘Supporting files’ section. 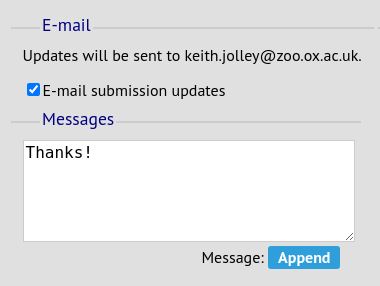 Make sure the ‘E-mail submission updates’ box is checked if you wish to receive E-mail notification of the result of your submission. This setting is remembered between sessions. New isolate data can only be submitted from within the appropriate isolate database. You may be required to submit isolate data if you would like to get a new MLST sequence type defined, but this depends on individual database policy. 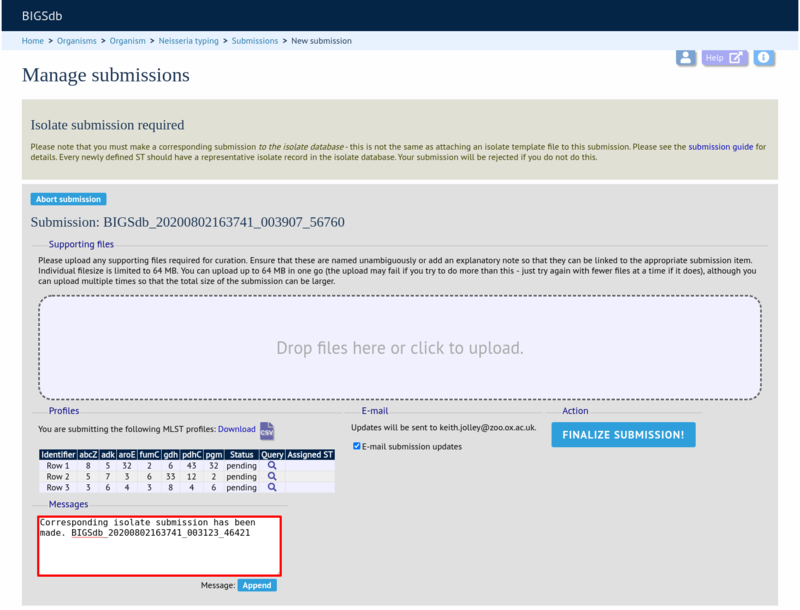 Click the ‘isolates’ link under submission type on the submission management page. Fill in the template. Some fields are required and cannot be left blank. Check the ‘Description of database fields’ link on the database contents page to see a description of the fields and allowed values where these have been defined. Where allowed values have been set, the template will have dropdown boxes (although these require newer versions of Excel to work). Some databases may have hundreds of loci defined, and most will not have a column in the template. 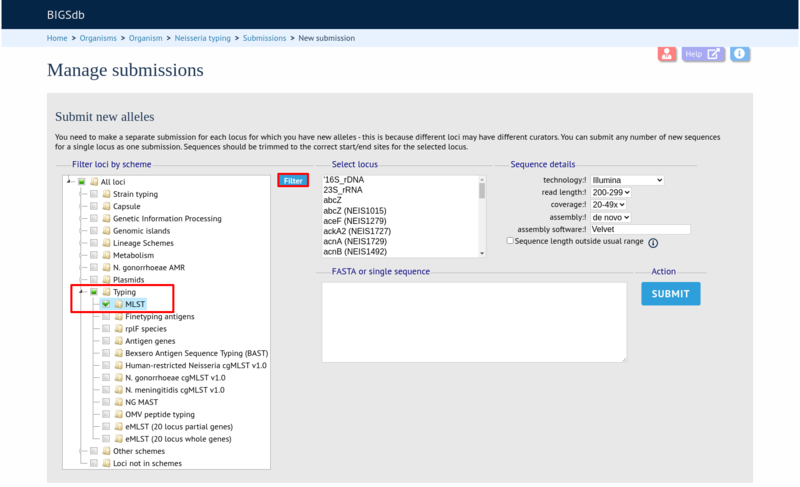 You can add new columns for any loci that have been defined and for which you would like to include allelic information for. These locus names must be the primary locus identifier. A list of loci can be found in the ‘allowed_loci’ tab of the Excel submission template. Some basic checks will be performed. 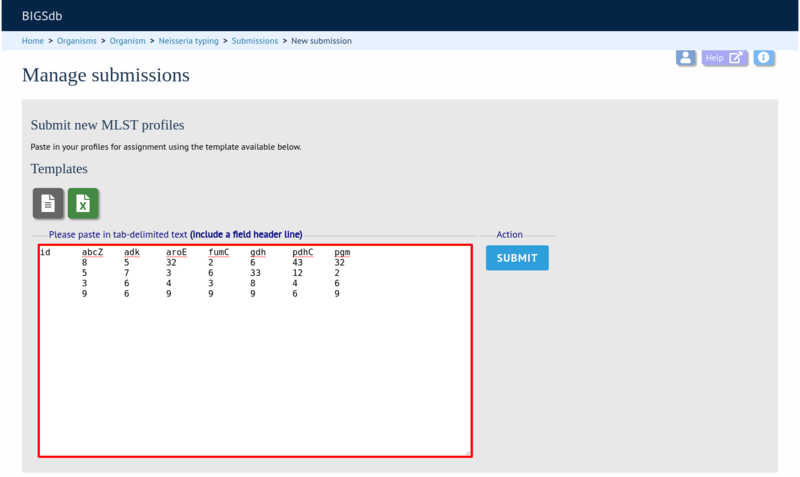 These include checking all field values conform to allowed lists or data types. The submission cannot proceed if any checks fail. Provided the checks pass, you will then be able to add additional information to your submission. You can add any files required to support the submission. You may, for example, wish to include a genome sequence for an isolate record (contigs in FASTA format). If you are doing this, make sure that the filename can be unambiguously linked to the appropriate isolate record and add a message. assembly_filename - this is the name of the FASTA file containing the assembly contigs. This must be uploaded as a supporting file - you will not be able to finalize the submission until every isolate record has a matching contig file. sequence_method - the sequencing technology used to generate the sequences. The allowed values are listed on the submission page. 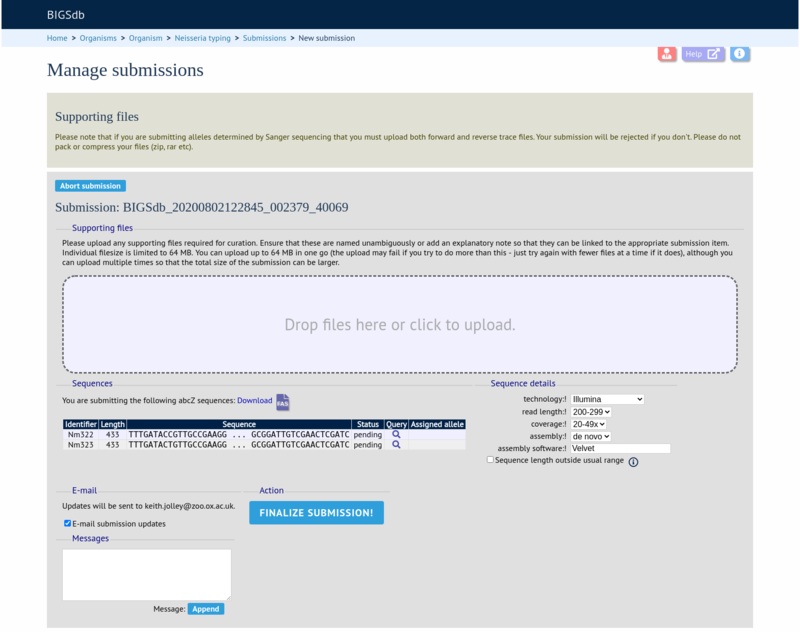 To start the submission, click the ‘genomes’ link under submission type on the submission management page. Then follow the steps for isolate submission, uploading the contigs files as supporting files. Once a submission has been closed by a curator, the results will be displayed in your ‘Manage submissions’ area. You can remove submissions once you have noted the result by clicking the ‘Remove’ link. Alternatively, submissions will be removed automatically a specified period of time after closure. By default, this time is 90 days, but this can vary depending on the site configuration.